Facebook is to introduce new controls allowing users to create privacy distinctions between friends, family and colleagues. The features will give users more control over who sees information stored on their profile pages, choosing which friends can view photo albums, mobile phone number or email address. Thank God for small mercies. This type of functionality should have been built into Facebook from the word go. For me, this addition is too little, too late, especially given the massive number of users that Facebook now enjoys. The thing I find increasingly concerning is the fact that so many people consider themselves perfectly safe on Facebook; they just don’t see any risks. They consider it a safe place to be and are happy to throw up all manner of personal content with little or no regard to the consequences. Facebook has been in the news a lot recently. An instant messaging (IM) feature is soon to be rolled out to users allowing real-time collaboration on the typically worthless junk that people post. Oh great. Also, in this week’s TWiT, Leo Laporte reminded us that Facebook as a social networking site is an ideal means of collaboration for terrorist cells. Granted, the same could be said of many such sites and other online technologies but it’s a fair enough point. Obviously the company should and indeed does engage in some degree of monitoring of users’ content, ready to notify security services if necessary. Then again, monitoring content for national security threats is one thing. Making use of user-generated content for any reason they see fit, is quite another. Lost London Law Student recently brought another fact to my attention. Quietly hidden away in their terms and conditions, Facebook grant themselves the right to make free with users’ content for virtually any purpose they see fit, including promotional advertising material for the company. 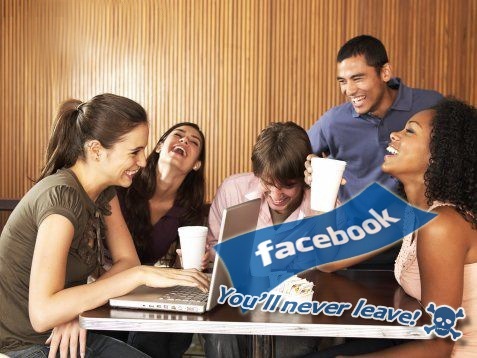 LLLS posed a reasonable question: whether such material features on the facebook/iphone advert? Who knows. But do other such sites do this - My Space, Bebo, Flickr and all the rest? Well, so far, I’ve been unable to uncover another social networking site that seeks to grant themselves far-reaching rights to utilise their users’ content in the same way. Facebook then have the audacity to add later on in the terms and conditions: “We respect the intellectual property rights of others”. You what, Facebook? Hmmm, maybe you do, but clearly not that of your users when it comes to using content for your company’s own ends. I suppose it’s not so much a major problem – the type of trashy content users typically post to Facebook is scarcely suitable to be used as a national ad – but it’s cheeky nevertheless. And, yes, it’s yet another reason for me not liking Facebook. Senior police officer, Inspector Chris Dreyfus, was denied promotion to chief inspector level after it was discovered he had previously received a disciplinary warning from his seniors at British Transport Police over posting personal information about his gay lifestyle on the social networking website Facebook. Oh dear. Sharing information as to your free-time antics is often frowned upon by employers and maybe this was an example of poor judgment over anything else. But still, it remains another reason why Facebook can be more hazardous than helpful. I made use of the new privacy feature recently - they're a bit abstruse! Have you ever been registered on fb? Nope, I have never been registered myself, but have watched others on it at times. Like I said before, I just can't bring myself to do it now, even if I wanted to, because of the principle of the thing. I've said it before, I'll say it again; Facebook is Pants - why dont people just talk to one another or email if they want to be in touch? Why must you be compelled to add dizty and erroneous applications like "What character from Heroes/Winnie the Pooh are you"? or " How big of a Flirt are you"? until your page is so nauseatingly LONG it takes you three YEARS to read it!! This said, I am a member of Facebook myself - not because I find it particularly useful,or even as addictive as blogging, because I dont - but just because I am swept up in the tide of lost contacts trying to contact me!! Know exactly what you mean - the number of applications is as disturbing as it is baffling. I still don't get 'pokes' - what's the deal there? And seriously, who wants a virtual aquarium, or the ability to turn your friends into vampires, or a virtual 'my garden' or 'my graveyard'? The scariest thing, of course, is the fact this stuff is used so much. I recently discovered that there are universities in the US which are offering courses in how to design and write Facebook applications. Seriously, do we need more of this worthless trash foisted on FB users?